Work at Washington Station during last weekend’s foggy weather. Metro Blue Line Grand/LATTC, San Pedro St and Washington stations will close again this weekend as upgrade work continues. Planned improvements are similar to those already completed at other Blue Line stations, including new canopies, paint, tile and audio/visual enhancements. After this weekend, customers can expect one more weekend of the same closures (on June 12-14) before work at the three stations is finished. 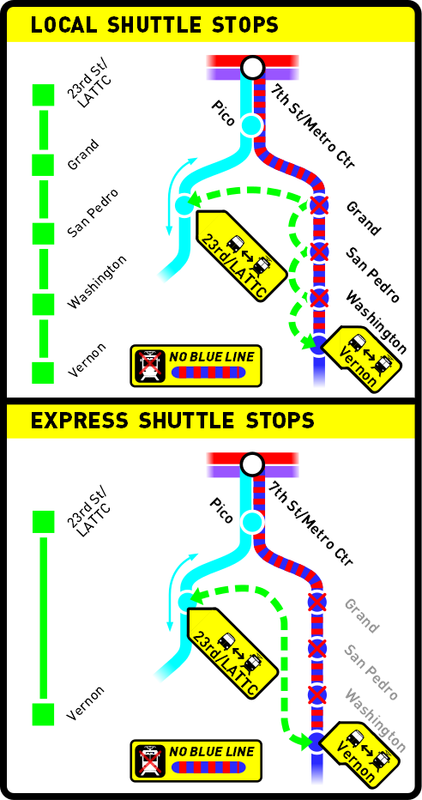 Here’s what Blue Line service will look like while upgrades occur: This Friday after 9 p.m. through Sunday, close of service, bus shuttles will replace Blue Line trains between 23rd/LATTC/Ortho Inst. and Vernon Station. There will be no Blue Line trains between 7th Street/Metro Center and Vernon, which means Blue Line customers must take the Expo Line to travel between 7th St/Metro Center and 23rd/LATTC/Ortho Inst., where they can connect to bus shuttles serving Grand/LATTC, San Pedro St, Washington and Vernon Station. Express bus shuttles will be in place for customers requiring direct travel between 23rd/LATTC/Ortho Inst and Vernon, in addition to the regular “local” bus shuttles that will serve each station between Grand/LATTC and Vernon. Trains originating in Downtown Long Beach Station will travel only as far north as Vernon. On Friday evening, June 5, the last two complete trips from Long Beach to 7th St/Metro Center will depart Downtown Long Beach Station at approximately 7:42 p.m. and 8:02 p.m. The last three trains from Downtown L.A. to Long Beach will leave 7th St/Metro Center at approximately 8:25 p.m., 8:35 and 8:45 p.m. For some customers, using a combination of the Metro Green and Silver Lines may make for a faster route between Downtown L.A. and South L.A./Long Beach. This Friday after 8 p.m., Blue Line will run every 10 minutes between Vernon and Downtown Long Beach Station. Expo Line trains will also arrive every 10 minutes until close, beginning at approximately 8 p.m.
On Saturday and Sunday, Blue Line trains will run every 12 minutes between Vernon and Downtown Long Beach Station, and Expo Line trains will operate every 10 minutes throughout the day. Finally, if you’re planning on biking to Beach Streets Uptown, the Open Streets car-free event taking place this Saturday in Uptown Long Beach, please keep in mind that Blue Line bus shuttle bike racks are only able to accommodate two or three bikes at a time. You may want to avoid the bus shuttle area completely by making use of our Blue Line park-and-ride stations, or using alternate routes (such as a combination of the Metro Silver and Green Line) to connect to the Blue Line at, or south of, Vernon Station. However you get there, it looks like it will be worth the trip! Is the station name changing again? It looks like this new station name is a hybrid of the old and new names.